There are many millennials that will swear on the use of technology as the future of marketing for your real estate business. That is certainly true, however some youngsters will believe in the fallacy of a digital-ONLY marketing strategy. Having an online presence is important, and finding success with just a website and social media is possible...but there is still a place in your marketing for traditional print marketing! There are considerably more real estate agents with websites and social media business pages now compared to 5 years ago. Most of your competition is online. And you should compete with your colleagues. Most agents will opt to stay away from marketing with the increased importance on online marketing, and new agents entering the industry without a marketing plan. With Facebook Ads, you can create a specific target audience. This is an easy task if you are familiar with Facebook Audiences. However, if you do not set your target demographics correctly, your ad might not be seen by everybody you want it seen by. If you send mailers to an entire neighborhood, you can ensure everybody receives your marketing materials. One strategy we recommend with social media posting is to share infographics, such as "6 Reasons You Should Consider Selling Your Home Now" to your social profiles. 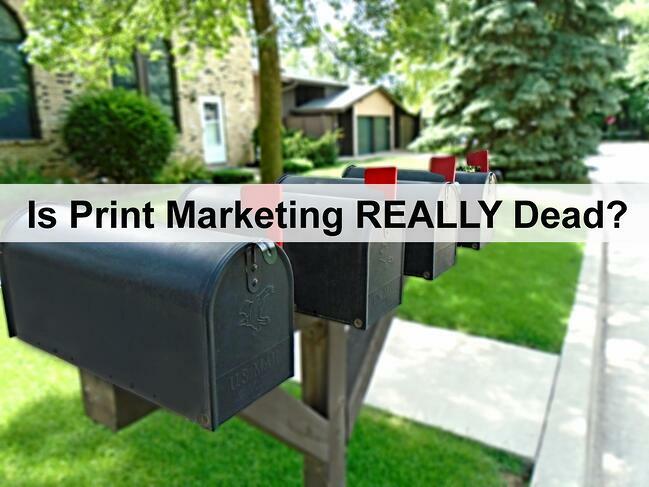 Now imagine if you printed out a postcard with "6 Reasons You Should Sell Your Home Now", your prospects will be more likely to pay attention to the material you just mailed to them! What if you sent them a postcard with information on "How to Increase Your Home's Value", and at the bottom it read: "Want to learn more? Visit My Website!" along with your contact information. You are more likely to get website traffic or emails waiting in your inbox from your mailers if you give prospects a compelling reason to visit your website or contact you! Here at Zurple, we are all about nurturing your leads online for you. This includes leads we generate for you, leads you generate yourself, and leads from print marketing that you import into the system. We are here to convert those leads into clients.